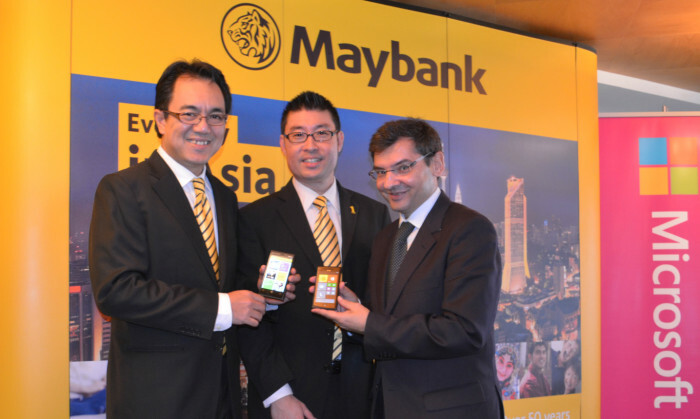 Malaysia – Maybank is the first ASEAN bank on board Microsoft’s Windows Phone 8 platform for the Maybank2E-Regional Cash, its corporate mobile banking applications. The move opens up an additional channel as corporate clients can now access Maybank2E-Regional Cash on more mobile platforms, when previously the service was available for users on the iOS and Android platforms. Maybank deputy president and head, global banking, Datuk Abdul Farid Alias (pictured left) said the addition of the Windows Phone 8 platform increased the ability of Maybank’s regional clients to manage their cash flow on-the-go. Customer experience is also expected to be enhanced with the touch-optimised and tiles-based user interface of the new platform. Datuk Farid added that following the launch of Maybank2E-Regional Cash in Singapore last November, customer feedback has been positive with refinements made along the way to ensure maximum compatibility to our corporate clients’ needs. He explains that the app helps enhance corporate client’s capabilities, enhance their efficiency and reduce operational risks and costs. “We want to ensure we remain relevant to our corporate clients using any mobile platforms and we aim to cover other dominant operating systems as well. This will soon include the Blackberry 10 for mobile platform,” he added. With the adoption of Windows Phone 8, Maybank is expected to bring on board more than 10,000 corporate clients across the region with an estimated more than RM1.88 trillion in transaction value by 2015. Carlos Lacerda (right), managing director of Microsoft Malaysia, announced that the new platform is off to a great start with more than 60 million Windows 8 licenses and 1.5 million Surface tablets sold worldwide. Maybank2E-Regional Cash caters to the diverse needs of corporate clients and is available in six major languages, namely English, Bahasa Malaysia, Bahasa Indonesia, simplified and traditional Chinese, and Japanese. Maybank2E-Regional Cash is already available in Singapore and Malaysia since 2012 and will be made available in the Philippines, Greater China and Indonesia by end 2013. All you need to know about working with influencers and the future of social and e-commerce. ..